This guide is aimed at F2Pers. You can apply the same idea to member RCing, and even find faster ways of executing them. If you're just starting a new account, or have never really ever runecrafted before, you won't make any money initially, but as you level you will make so much that you don't know what to do with it. You must realize that you will be losing a very small amount of money until you reach the ability to make many multiple runes. Yeah, I screwed up this pure, but I don't care. 13.5m gp! Basic knowledge of Runecrafting (running to the altar and back). Must have an understanding of how multiple rune crafts work. You might want to get the Explorer's ring (which can be got by completing the F2P Lumbridge diary thing). It gives you a small chance at an extra rune per essence craft. It's not much, but it matters in the long end. First thing you need to do is get some runecrafting levels (if you don't have any already). You do not need the Rune Mysteries quest for crafting, just for mining the rune essence. 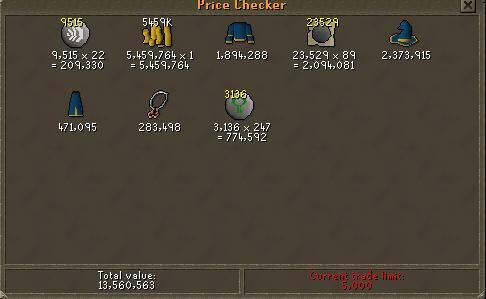 Go to the Grand Exchange and buy an Air Tiara and as much rune essence (not pure essence) as you possibly can. Just craft air runes. Never craft mind or fire runes. On top of those two runes being the lowest priced runes for the longest time ever, they hardly ever sell in GE. The money makers are usually air, water, and eath. In my experience water always yielded the best results. e=cost of a single rune essence at whatever price you're going to buy it at (low, mid, high). q=quantity of essence bought/going to buy (to find out how much money you make each run make this 28, or exclude this variable to find out how much you make per single essence). If you run this formula and you get a negative number, that means that you will lose money. This could be because the prices have changed drastically, or you're not a high enough level yet. Change the variable m one number higher (as far as the game will let you go) so you may find out if you can make profit on it on a higher level. If none of the runes at your level give you profit, do air only, as air always sells. Air is the most commonly used rune - nearly every spell needs it. 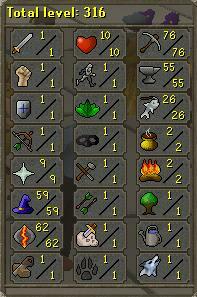 For example, at level 62 runecrafting I'm able to craft 6 airs and 4 water runes per essence. At the time of writing air is worth 22 mid, and water 38 mid. Essence was worth 89. This means that for each air run I would make a profit of 1204 gp. I would have spent 2492 gp on the 28 rune essence, but would have gotten 3696 gp worth in air runes. This means that for each water run I would make a profit of 1764 gp. I would have spent 2492 on the 28 rune essence, but would have gotten 4256 gp back. Now, of course, you will be making slightly more since they added an update that gives you a chance at double runes, and even more if you have the Explorer ring. One last thing that you have to take into account is distance and danger. Water running is more profitable than air running, but there are one or two NPCs that will attack you (not through the whole run though), and it's a slightly longer trip from the bank to the water altar than it is from the bank to the air altar. I prefer water runs, but it could be slightly slow. I haven't done the math on that yet.